The countdown to Teen Read Week begins! From October 17th to October 23rd, libraries around the country celebrate teen reading by holding Teen Read Week activities. 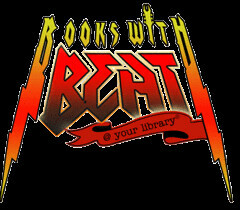 This year's theme is "Books With Beat". Check out the HCPL events calendar  to see what your library is doing this week. When conservative Leo Carraway loses his full ride scholarship to Harvard, he is forced to turn to his biological father, punk rock legend King Maggot, for help. Part road movie and coming of age story, Born to Rock  by Gordon Korman is a perfect mix of comedy and drama. I must confess. Cecil Castellucci is my favorite Young Adult author and this is one of my favorite books. Beige  refers to the nickname given to Katy by punk rocker chick Lake when Katy is forced to spend the summer with her father, a punk rock legend nicknamed "The Rat". Lake thinks Katy has no personality of her own. She's quiet, she's polite, she does what she is told. She's beige. Or is she?